INVOLVING CHILDREN IN RAMADHAAN ACTIVITIES. During this Holy Month we often ignore the children once we settle in doing our Ibaadah, we forget that children are as eager and excited for this month just the way we are. Involving them in activities during Ramadhan brings them closer to Allah as well as it is family time. 1.Search for the moon together. Well let’s put those telescopes to use this Ramadhaan, search for the moon together if you are in an area where the skies are clear and the moon can be found. Involve them in this fun activity and you can reward them for spotting it. 2. Encourage them to fast. Children from the age of 8 can be encouraged to fast half of the day, or fast a day then skips another. My younger brother started doing this at the age of six claiming he was a big boy and he should also fast, Mother made him breakfast at 6.00 a.m. and he ‘fasts’ till 2.00 p.m. eats lunch then waits till Maghreb. At the age of 7 he fasted a day and left a day till the last third where he fasted the last six days continuously. This Ramadhan he told us that he would like to fast the whole day with the family. This can be used to train the children to fast. The children should be told of the benefits of fasting and the ‘Do’s and Don’ts’ of fasting, this way they feel more excited in the prospect of fasting and earning rewards. In countries where Ramadhaan falls during Winter where there are shorter days and longer nights or in Tropic countries with equal days and nights involving children from age 7 in Taraweh prayers at least 4 to 8 units of prayers (Some Masjids pray 20 units while others pray 8 units) shows them the unity of Islaam, Muslims everywhere fasting together, breaking the fast together, praying together all worshiping One Lord, Allah. This involves the whole family, come together and make one big Sadaqah box. Encourage them to put in any coin they have. Also sort through the cupboards and remove any clothes which are wearable and in good condition. Most parents hoard their children clothes and store them in attics and basements taking up unnecessary storage space. Let the children say which clothes they would like to give away. And remember if they would love to give away recently bought clothes and those in perfect condition let them be. Involve the children while having Suhour and Iftaar, older children can be woken up to have Suhour with the rest of the family, while the younger children during Iftaar. Parents mostly shoo away children during Iftaar since they mostly do not fast, let this Ramadhaan be different. Let the children sit with you about ten minutes from the Maghreb Aadhaan, let this time be your Duaa time. Help your children compile a ‘Dua List’ of the things they want to ask Allah, remember Allah is closer to those fasting near breaking the fast and is separated from them by a single veil. Let them know that Allah is the Sole Provider and Granter of bounties and blessings. 6. Make a Ramadhan time table. Make one for yourself and one for your children. Plan your time so that you have your Ibaadah, time to prepare Suhour and Iftaar and time to spend with your children. You can download Quraan Apps and read Quraan in the bus, lunch break during work and you can put a lecture in while you are cooking. Women have proven over time to be great multi-taskers. Men can play a lecture or Quraan too while driving, walking, cycling or taking the bus. 7. Memorising and Understanding the Quraan. Let Hifdh and Tafseer be a family affair. After having Iftaar save 10 to 15 minutes for Tafseer or Hifdh, you can do this alternatingly. Pick a chapter or some verses to memorise then the next day listen to one another and try understanding the meaning and reason for revelation, whoever memorises can be awarded, encouraging memorisation and understanding of the Quraan. Put the Disney Bedtime stories and movies away and buy some Quraan and Prophet Stories. Alhamdillah for technology because animated stories and movies from the Quraan are a click away. Indulge them in the adventures of Khaleed bin Waleed, let them learn of the humility of Abubakar, kindness of Umar, generosity of Uthmaan, compassion of Rasulullah and fierceness of Ali. The stories of Nabii Musa, miracles of Nabii Isaa, patience of Nabii Ayyoub and perseverance Nabii Nuh. Let them take a Prophet a Day and some of the prominent Sahaabas for them to know of their Islamic heritage and history. Teach them little sunnahs like removing harmful objects on the way, using a miswak, helping people, smiling, giving Salaam and tasbeehs and the small daily adhkaar. Let them learn a Sunnah a day and try practising it for the rest of the month. Tell them of the benefits of the Holy Night and show them by increasing the Ibaadah during the last third of Ramadhaan. Search for the night together and for boys of age, they can join their male relatives for Itikaaf in the Masjid. Let this Ramadhaan be a time to bring you and your family together and closer to Allah. Rome wasn’t built in a day, so do not try everything at once, gradually introduce them as the Holy Month progresses. May Allah make this Ramadhan fruitful and beneficial to all of us! Finally, the most awaited month in the Islamic Calendar has arrived. Alhamdillah, most of us already have it planned out. 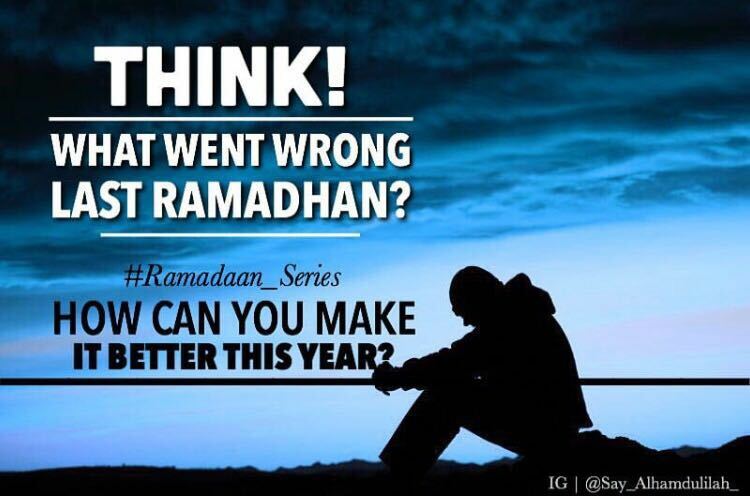 May Allah make this Ramadhaan our turning point so that we can be better Muslims. Allah Almighty gave us this month so that we could change and so that He could forgive us. How many of our relatives our friends someone we knew who was with us last Ramadhan and are not here today? Allah gave you this chance, how will you use it? Ramadhan is the most conducive time for your Ibaadah, time for you to repent, afterall Shaytan is locked away…. It’s up to us to decide what we want to do this Ramadhan then ask Allah Almighty to give us Tawfeeq to do it. Are we going to be in a loss? This was a supplication by an Angel and replied to by a Prophet. Not just any Angel but Jibreel (Alayhi Salaam) and replied to by Rasulullah Muhammad peace be upon him. Or are we going to be among the successful? All we need to do is repent sincerely and Surely Allah is MOST FORGIVING! Allah wants to forgive you…. Ask Him and He surely will forgive you. Except those who repent, have faith and good deeds, those Allah will charge their sins for good deeds. Certainly Allah is most forgiving and merciful. That’s your first step, ask Allah for His forgiveness and He surely will forgive you. Secondly, make a timetable for your Ramadhan planning. Whatever you want to do put it down in a nice organized manner,after all Muslims are organized people. Work: Remember fasting is not an excuse to be inefficient at work; neither does it justify being ill tempered because you miss your coffee! Concentrate on dhikr especially while waiting in traffic, while driving to and from work and school etc. From Asr to Maghrib: 30 minute nap, family time: discussion, reciting Qur’an, watch an educational program, narrating the prophets’ stories, prepare Iftar, any other task you planned etc. Breaking fast: Break your fast with dates and water as it is sunnah, and also has numerous health benefits. Isha/ taraweeh: It is not necessary to spend hours in traffic to go to a mosque with the best sheikh/ imam in the city. Choose a Masjid that is in your neighborhood! Keep each Salah as a time interval between tasks, so you can pray at the masjid if possible. 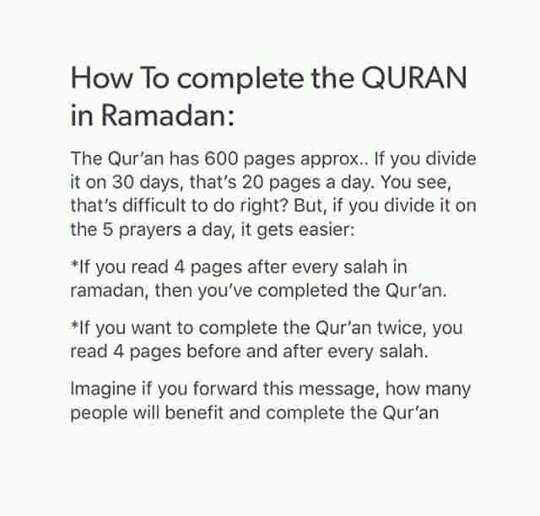 Ramadhan is the month of Quraan, Read Quraan as much as you can and also reflect upon it. Reading Quraan without reflecting upon it is of no use at all. We can mutter it with our tongues but not reflect in our hearts. It is best to read 10 verses and reflect upon it than read 10 surahs without reflecting upon it at all. Don’t forget to pray Taraweh in your local masjid. Look out for Laylatul Qadr, The Night of Power a night better than 1000 months! Before you start this month, start it with a clean heart. Don’t hold any grudges.Forgive all those who wronged you. BE CONSISTENT IN YOUR DEEDS DURING RAMADHAN AND AFTER RAMADHAN TOO!